This entry was posted in General on April 14, 2019 by admin. Conferences and trade shows provide a great platform for showcasing your brand to a large group of people. Trade shows are a perfect opportunity to attract and engage with your target customers. With hundreds of exhibitors, it is important for your brand to be unique. Spend some time on brainstorming to find creative touches and present a memorable trade show presence to your audience. Here are two important booth design elements that can help you get ahead in the game. In a technology-driven age, it is difficult to attract customers and stand out in the trade show crowd. You need to include digital signage in your booth space that sets your brand apart from a sea of similar exhibits. Design a cohesive look to convey your brand message in a compelling way. Choose the right signage to make your displays more visible. They will evenstand out on a crowded show floor. The colorful and eye-catching 3-D exhibit signage, with strong branding, can attract attention and draw in new business opportunities. This is a growing trend among companies across multiple industries. Deliver targeted content through backlight exhibit signage that offers a new look to your trade show products. Keep the signage message short and to the point. The stunning LED light system can make the graphics glow with a minimal amount of energy. Even in a dimly lit trade show hall, these can engage, enchant, and energize your audience. Hanging overhead fabric banner signs available in round, square, pinwheel, rectangle, and triangle structures can communicate your unique message for vibrant brand marketing. These are the perfect solution to emphasize your presence, maximize visibility, and draw in customer attention from a long distance. Choose interactive digital signage that helps your visitors to touch, swipe, and interact with your business’s services for active customer engagement. 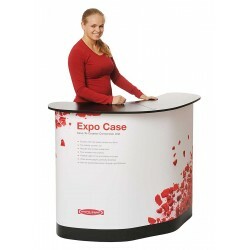 These act as an effective product and branding strategy for both large and small expo marketing events. As an event exhibitor, it is essential to create a technological environment for promoting your brand. Social media walls do more than just let attendees watch something. Engage your trade show event guests by displaying their social media content (Facebook, Twitter, and Instagram) onto the big screen. Simply create a hashtag and encourage your trade show attendees to talk about the brand. Since anybody can use the hashtag, this not only encourages customer participation but also lets them discuss your products. Collect all the relevant media output about your business and put it on your trade show display to create a big impact on your marketing goals. When these visitors see a feed of social media posts appearing on a large digital screen, it can help to create a high level of customer interest, drive engagement, and boost sales. The live wall display system helps you get new followers, expands your event’s reach, increases online networking, and boosts social sharing. As they provide a source of entertainment, people are likely to use them. They can help to keep your customers entertained and happy. Social media walls create a visual impact through customized display options. You can use them to incentivize people with more social shares through brand recognition. 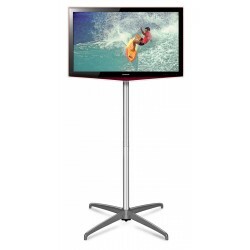 Display social media messages, images, and videos on a large display to bring a buzz to your live marketing event. When you honor the most active participants, it can help to attract booth traffic. Are You Ready for the Next Trade Show Event? The Adobe Summit, MozCon, Consumer Electronics Show, B2B Next, the Small Business Expo, 99U, the Startup Conference, Techweek, Microsoft Ignite, the FutureTech Expo, TechCrunch Disrupt, and the SaaS Connect are some of the top trade shows to market your business at for maximum exposure. Visit us to buy high-quality banner stands, retractable banner stands, roll-up banner stands, and stand-up banners for guaranteed brand engagement. 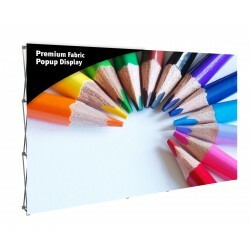 This entry was posted in General and tagged roll-up banner, stand-up banners, fabric banner, banner stands, retractable banner stands on March 3, 2019 by admin. A successful trade show can be your biggest marketing move of the year. Trade shows are a face-to-face opportunity used to establish a customer relationship and make valuable connections with business partners. They can have a meaningful impact on your conversion rates. Even if a prospect doesn’t convert, you can use the lead to nurture the sales process. Impressive multimedia booths, games, contests, celebrity performances, private parties, interactive sessions, and video demonstrations feature a great booth experience for visitors. The energy and excitement produced from booths can help your brandattract trade show attendees. Despite all the excitement, live marketing events can help to define your goals, fine-tune your sales pitch, generate new leads, engage with existing customers, and close big deals. Make use of this incredible marketing opportunity to show off your new, exciting products and services to the right kind of people. With so many design options to consider, here are three critical ways for building a creatively designed booth space. As technology continues to progress, we see a lot of changes in the trade show industry. Video wall technology has a significant impact on how your business information is conveyed in a wide range of event environments. Video walls offer an audiovisual effect for the targeted audience. The reduction in price of LED screens makes them affordable, so investing in video wall technology over traditional displays is great. You can implement an interactive element into an LED video wall, either by using an application on a mobile device or through a touchscreen that augments the content. A visual product demonstration can enhance overall event engagement. You can develop an interactive audio-video experience for your audience. A series of LED video walls was crafted for the lobby of the Salesforce Company in San Francisco to create a sense of wonder for everyone visiting the building. The amazing digital display transformed the entire room into a mesmerizing, virtually real, environment. You too can maximize your brand presence by being creative on your LED deployment, thereby making an impact on the show floor. Design your exhibit booth space by truly understanding your customer needs. Your trade show booth should communicate your brand to the audience. The ultimate design goal is to grab the attention of the right attendees with a brief and bold message. Use clear and eye-catching graphic fonts. These act as a quick and effective medium to clearly state what your brand is all about to customers who are interested in your products. Concision is the key. A single, clearly stated message is better than long listed points that get ignored. Make sure that your floor plan provides sufficient space for the demonstration area, meetings, lead stations, and an inviting space for booth visitors. Build a comfortable atmosphere by stimulating the senses of your prospects. Use a combination of lights, textures, colors, and aromatic fragrance. With comfort in mind, include spaces for recharge stations, relaxation areas, and meeting rooms. Focus on displaying your main products rather than stuffing too much into a limited booth space. Doing this distracts the customers. Your trade show booth could get lost in a sea of giants. If you’re worried that your display’s exhibits won’t stand out or gain customer attention, we have solutions to showcase your products. Whether you’re in the automotive, technology, or food and packaging industry, you can use the following design tips. Design a display that focuses on your industry. If your business focuses on the food industry, choose a theme related to café or farm environments. Include fresh display designs that leave a lasting impression. Provide your visitors with a full sensory experience: let them see, smell and touch the food products. Use oversized display tools to catch eyes in a large gathering. 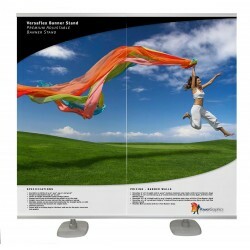 Based on your budget, place a series of large format banner stands to create a wall or backdrop. Hanging graphics with eye-catching designs can guarantee a strong brand presence. 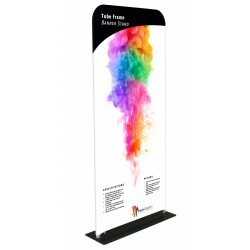 This entry was posted in General and tagged stand-up banners, fabric banner, roll-up banner stands, banner stands, retractable banner stands on March 3, 2019 by admin. This entry was posted in General on February 10, 2019 by admin. Banner stands are an easy, quick and professional solution that can be used for both at indoor and outdoor marketing events. Marketing through trade show banner stands has become an integral part of enticing visitors to your booth. It is a cost-effective way of advertising your products and services, thereby adding a visual impact through eye-catching graphics. Without saying a word, you can convey your promotional message on a crowded trade show floor. Listed here are a few benefits of banner stands. 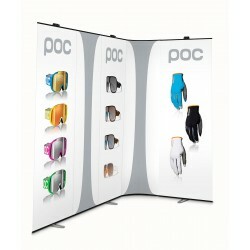 The banner stands for trade shows come in a variety of different styles and layouts. 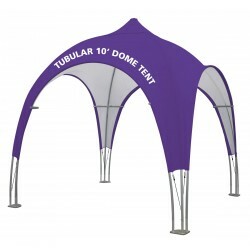 You can choose a curved or a linear design based on your marketing requirements. 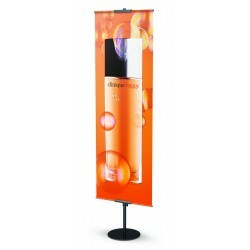 If you’re looking to display your brand in two different directions, make use of two-sided banner stands. 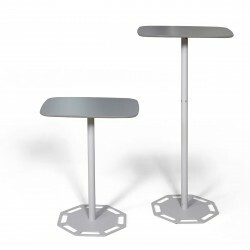 These adjustable stands can be altered to single or double sided for using at various exhibitions, trade shows and other promotions. 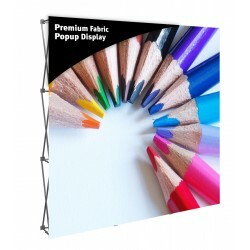 Some of the popular banner stands include tabletops, tension fabrics, pop up-A frame, canopy tents, portable, outdoor, and retractable banner stands. All customers want their banners to last a lifetime. If you want your banners to stand strong for your brand long-term, make sure the marketing materials used on your stand can withstand seasonal display or repeated use. At Banner Stand Pros, we design high-quality graphics that are printed on smooth opaque vinyl to resist curling. 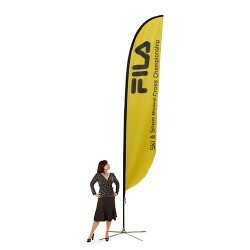 There are weather-resistant banner stands that are made to last through heavy rain and tough winds. Our stands feature sturdy aluminum bases to guarantee a more stable display presentation for events and in-store promotions. Lightweight display systems are indispensable for modern communication. Typically set up in less than a minute, and only weighing about 19lbs each, most of our banner stands come with a lifetime warranty. These stands are easy to carry in marketing events. They are sturdy, adjustable and easy to assemble and disassemble. The slim and discreet design occupies very little floor space. They are perfect for those who need a flexible system that can be customized to match different needs and requirements. Your brand’s values will be reflected in the quality of your image, so make sure you’re presenting it in the best possible way. If you’re looking to switch your graphics on a regular basis and need a banner stand that won’t take up too much floor space, check us out. Browse through our selection of products and find the perfect displays for your event. Find the product you want? 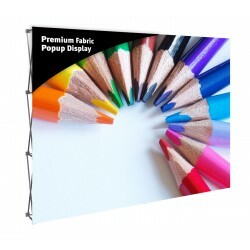 Call Banner Stand Pros at 877-389-8645 and we’ll help you with trade show display needs. Use our online contact form, call, or chat with us if you have any questions about our products. This entry was posted in General on December 23, 2018 by admin. Tradeshows are an excellent way to meet prospective customers and gain exposure. Boosting sales is the number one objective of any business event. With a wide list of competitors, you have to be smart when exhibiting your company’s products and services. If you’re at a loss for ideas, try using one of these tips to make your booth more effective. Use formal invitations for your most important customers and leads that you would like to see at the event. You can send out an invitation digitally to your regular customers. If possible, attach free trade show tickets along with the invitation. This way you can attract someone that you’re trying to impress. If your budget allows for it, create a VIP invitation card, because these offers are hard to refuse. If you promote your booth well, you’re going to have a lot of visitors. That means you will need trained employees who can communicate your brand message and mingle with guests appropriately. Hire people who are great communicators and who have an easy time making small talk with strangers. These people should be outgoing and strong salesmen. Involve everyone in a training session beforehand, that way everyone’s on the same page. Refreshments are a great way to attract people to your booth. It’s common at marketing events that people get busy and don’t have time to eat or drink. You can provide food and drinks and fill that void. Make use of this time to engage with them and direct your conversation toward sales. This tip can also keep your visitors’ energy levels up. Refreshments can include things like water bottles, cookies, coffee, candies, popcorn, or sandwiches. You can consider presenting these items in small bags that display your company’s logo as well. This tip is especially important for anyone that may be new to exhibiting at a trade show. The booth location matters a lot when it comes to garnering attention. If you’re tucked in a corner without much foot traffic, you’re not going to have a good event. So, while working with the event coordinator, try to get a space close to the entrance, main aisles, and busy networking areas, that way you’re more likely to get some traffic. Your display stands are the first thing tradeshow attendees will notice. 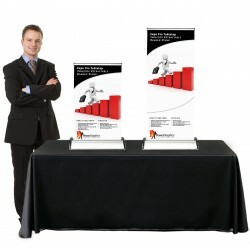 Your banner stands should be highly attractive to impress them. 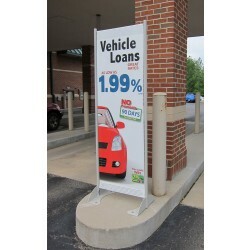 Retractable banner stands, outdoor banner stands, and tabletop banner stands are the most cost-effective options for displaying your products. We have inexpensive and lightweight banner stands and also provide a wide range of custom printed banners with bright graphic designs and durability. These can help project your message to a larger crowd, creating a professional impression among your clients. With us, you can order stands and banners at affordable prices. You can also check out our many other products that can help you at any event. Tradeshow success happens when individuals visit your booth and become interested in your products enough to either purchase or give you their contact information so you can follow up. It’s essential to make your booth attractive for people to come by and check it out. Here are a few critical tips to attract your potential customers. If you want people to sit up and notice what you have to offer, focus on the booth design. This includes making use of all available floor space, using appropriate and visually appealing graphics, and using concepts that reflect your marketing campaign and brand image. 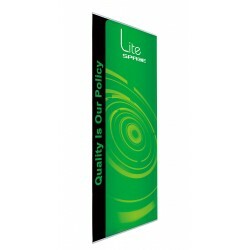 You can use banner stands in a variety of different settings that add visual impact to your display. If you’re looking for high-quality banner stands, we have a vast collection of retractable banner stands, and outdoor banner stands at attractive prices. Don’t we all love gifts? If you want people to remember you after they’ve left the booth, give them something that’s related to your brand or product. It can be something inexpensive; or it can be entertaining, useful, fun, or valuable. The more people like your giveaways, the more buzz you create to then attract audiences. You can consider gifting re-usable water bottles with your logo, T-shirts, pens, custom phone stands, USB chargers, promotional smart wallet, product samples, personalized tote bags, etc. Make sure that your staff is trained and looks professional. You can make them wear a uniform that represents your brand, or get your logo emblazoned on their t-shirt. Most importantly, it is essential to employ teams that are experts, i.e. they should understand your products, services and company policies. Do not have booths overcrowded with staff because that could result in chaos and difficulty for your visitors. If a tradeshow doesn’t offer free Wi-Fi for attendees, it is smart to provide it yourself. You can rent a 4g internet provider for a few days to provide access to your booth attendees. You can use this time to network with people that have visited your booth. Similarly, you can set up a free phone charging station at your booth. Attendees usually use their smartphones to take photos, text, email and post your displays to their social media pages during the event. When their battery goes down, they’ll search for a free phone charging station like the one you have set up. Everybody loves participating in competitive games. As these activities benefit humans socially, cognitively, and emotionally, you can include activities like jumbo board games, trivia, or casino-style games to leave a long-lasting effect. Games used in tradeshows can encourage your attendees to reach out to you and will help you to keep them engaged for a while. As an exhibitor, choose an activity based on what your audience might enjoy. The more specific the better. These are five tips to keep in mind before exhibiting your products at your next marketing expo. You are sure to get a lot of prospective customers to your booth.